In a saucepan with a lid, bring quinoa and 1 cup of water to a boil. Reduce to simmer and cover, and cook until water is absorbed – about 12 minutes. Brush the inside of a muffin pan with oil. Whisk together sugar, flour, baking powder, salt, and 2 cups cooked quinoa. In a separate bowl, mix together oil, milk, cream, egg, and vanilla. Add milk to flour mixture. Stir until combined, then stir in cherries. Divide batter into muffin tin, filling each cup ¾ of the way full. Sprinkle tops with additional brown sugar. Bake 25 minutes. 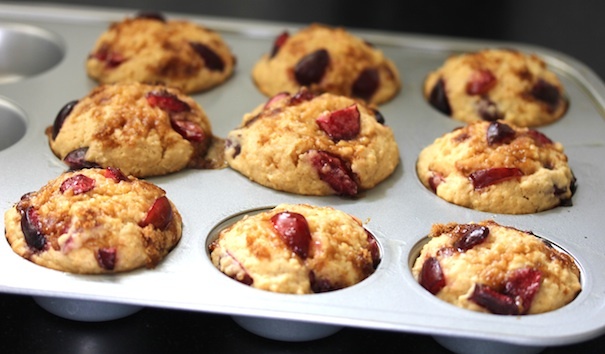 Allow muffins to cool slightly, and serve.